The new S5X Series Vibrating Screen will play an important role in crushing and screening industry. 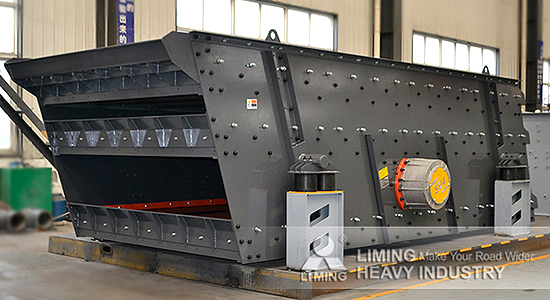 Following the VSI6X 1263 Vertical Shaft Impact Crusher, Liming Heavy Industry has launched S5X Series Vibrating Screen successfully. It has been highly praised by industry experts, and will play an important role in crushing and screening industry. S5X series circular vibrating screen is suitable for heavy, medium and fine screening and other screening operations. This banked circular vibrating screen is ideal screening machine for processing the materials after primary crushing and secondary crushing. It is also used for screening the final finished material. It generally applied to screening operations with the feeding size ≤200mm, grade size 2mm ~ 70mm. According to the R&D Engineer, vibration intensity G-force is a key indicator to measure the performance of the Vibrating Screen. S5X circular vibrating screen adopts advanced design and manufacturing process, the screening machine with a high G, in the case of the same size, it has larger capacity and higher screening efficiency than conventional machine. We believe that S5X series circular vibrating screen will provide more efficient, more accurate, more cost-effective screening operations services for our customers. It will play an important role in crushing and screening industry!